I had the pleasure last evening of presenting Edward Hopper’s art to a living room filled with enthusiastic minds, a reenactment of the 18th-century Salon in my eyes. 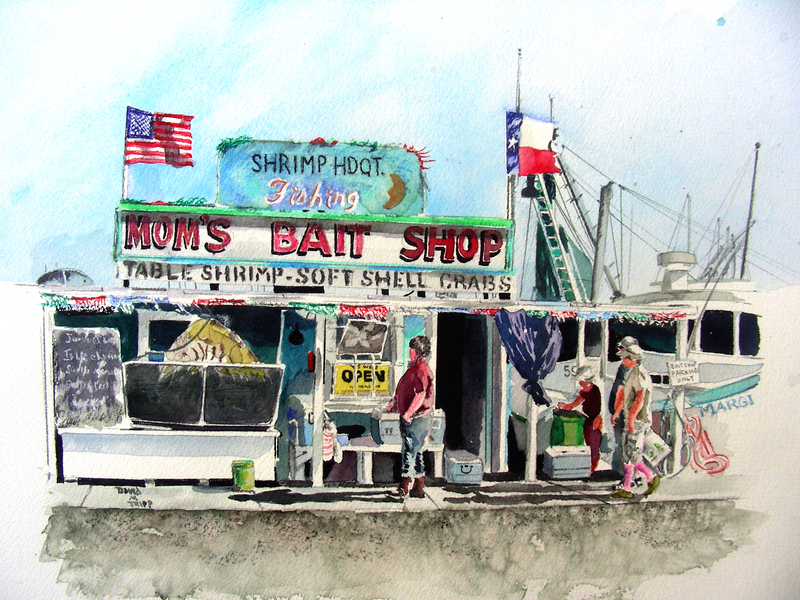 We spent time admiring his plein air watercolors of the Cape Cod towns. As I listened to others talking over his works, my mind wandered over the days past when I had the leisure to go on the road and look for subjects to paint in small-town Midwest America. 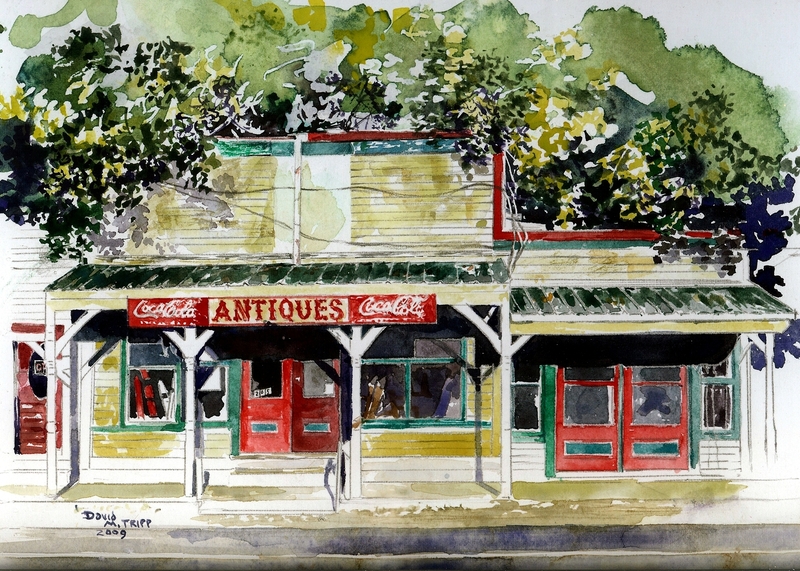 Above, I have posted one such painting from Winfield, Missouri, a small sleepy Mississippi River town north of St. Louis on Highway 79. I studied this abandoned store just as the sun came up and washed the town in its yellow light. Spring weather is trying to break through in Texas with the occasional rains and rising temperatures. Hopefully soon I’ll be outdoors capturing some local sights rising to new life after a long dark winter. In a traditional school setting, intensity is diluted by short and widely-separated class meetings, continuity is lost as everyone scatters to the winds at the end of each class period, and ideas dissipate before they ever develop. Since graduate school days, I have been regretfully aware of a lifestyle too hurried for ideas to settle and compost. Having been a teacher now for twenty-five years, things have not changed. Ideas sprout, but time is not allowed to water and cultivate them. The bell rings, another class begins and the subject changes. Even as a teacher, I face that issue–something comes up in class that gets my attention, but I cannot walk away and sit in silence, record it, modify it, work on it. Soon the bell rings, they leave, others file in, the bell rings, and we begin another cycle (with me, often another subject from period to period). One advantage that I do have as a teacher, though, is that I don’t have to dash out the door at the bell, and while students leave and others enter, I often scribble down the abbreviated notes of ideas that have seized me in the moment, and (sometimes) return to them later in the day when things have quieted. But still, I often turn back to old journal pages to find these notes abandoned as well. But thanks to the journal, they have at least been snared in the net, and I can disentangle them and re-work them. 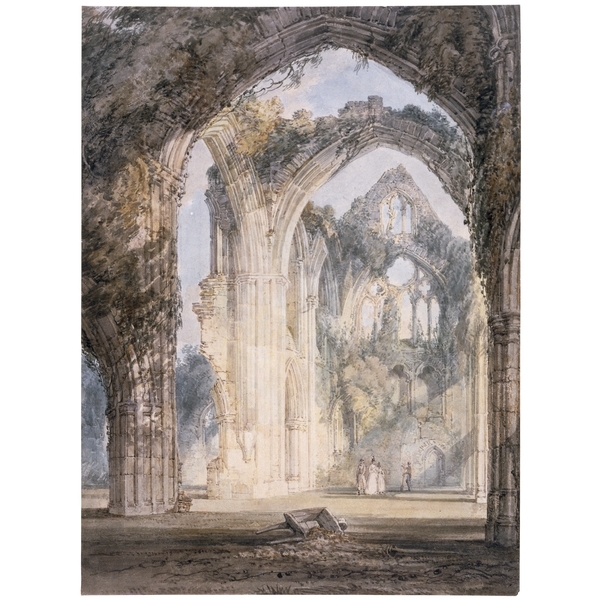 Today in Advanced Placement Art History, we looked at the English Romantic painters, and I had to pause when we viewed Joseph Mallord William Turner’s Tintern Abbey. This medieval wreck had stirred the imagination of William Wordsworth to the extent that he revisited the memory five years later and composed the poem “Lines Written a Few Miles above Tinern Abbey, on Revisiting the Banks of the Wye During a Tour, July 13, 1798”. 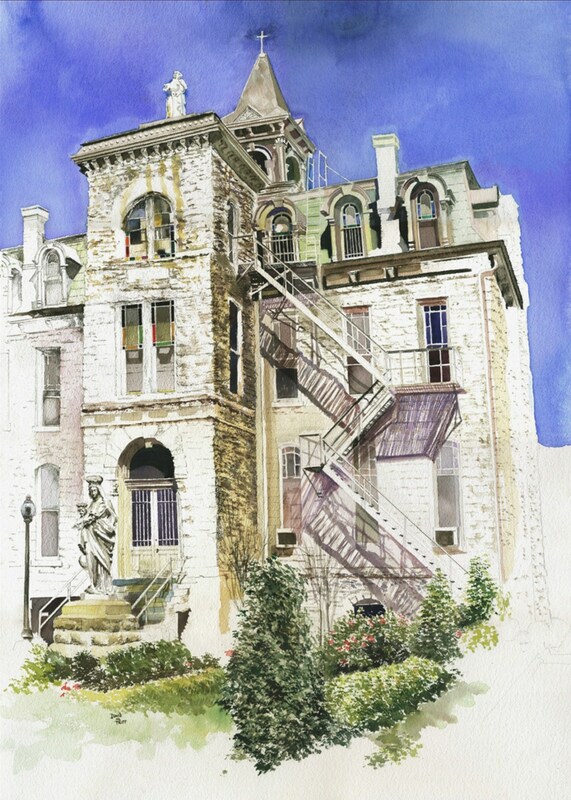 The poem then inspired J. M. W. Turner to create this marvelous pencil and watercolor rendering. My painting above is of Saint Ignatius Academy, located at 1206 Throckmorton Street in Fort Worth, Texas. 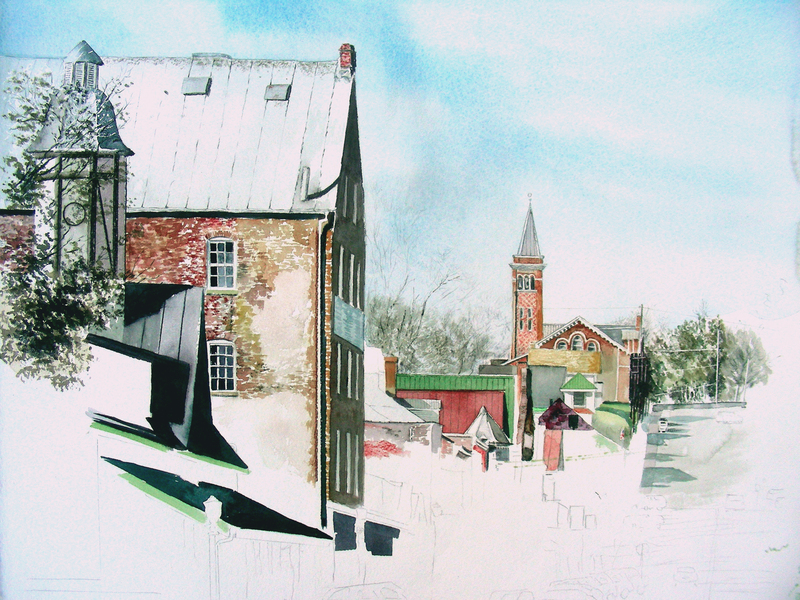 A few years ago, I had traveled to the city with the intention of painting Saint Patrick’s Cathedral, only to find the building in too good condition for a rustic painting. I turned in surprise to see this neighboring structure, from 1889, erected in the French Second Empire style. The facility was no longer in use, and as I strolled the grounds, looking in windows, sitting on steps, observing closely the weathered portals and window frames, I felt the same sense of loss and presence that floods the minds of romantics when they look upon ruins that once thrived. And I had to paint it. Memories and significant ideas are always visiting us, and if we don’t find a way to hold them, mold them and preserve them, they scatter to the winds.
. . . your desire to make art–beautiful or meaningful or emotive art–is integral to your sense of who you are. Life and Art, once entwined, can quickly become inseparable; at age ninety Frank Lloyd Wright was still designing, Imogen Cunningham still photographing, Sravinsky still composing, Picasso still painting. I love that point raised by Bayles and Orland. If I could be fortunate enough to live to see ninety, I would hope that I still have the eye and the steady hand to continue making art. I still feel like a student, am still filled with surprises at every turn, and love the discovery of new ideas and techniques. I make art because it is in me; I am not complete when I’m not making something new. This morning, I am exhausted from finishing a three-day art festival that featured frigid temperatures and high winds. Nevertheless, sales were O.K., and the conversations with patrons were very warming to my soul. I am grateful for all the positives that came out of this one. I have two weeks before the next festival, and plenty of time to rest up and recuperate. All things considered, the festival was a good experience, but it meant three days without making art, so I am itching to get back into the studio. I promised in an earlier post to share my favorite memory from the art festival circuit. 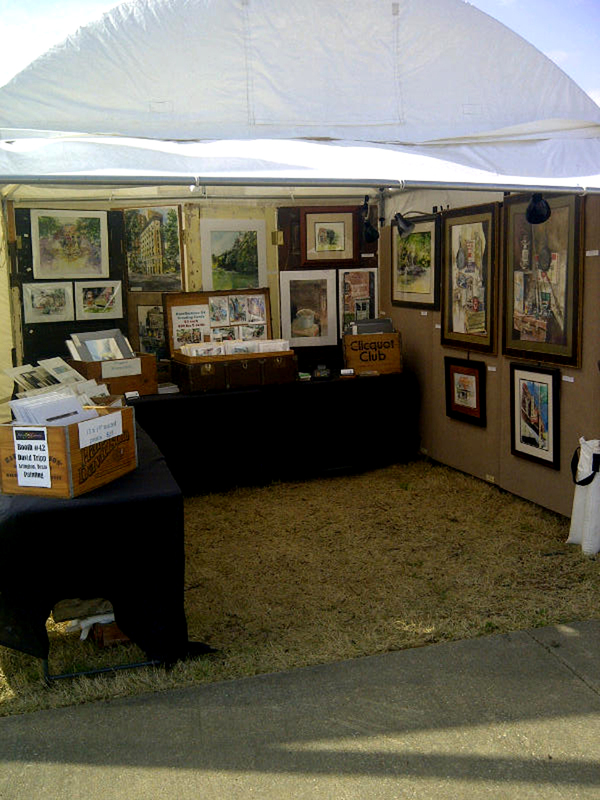 Every October, I participate in the Edom Festival of the Arts in remote east Texas. The setting is rolling pastureland with several barns and sheds scattered around the property and enormous shade trees. The booths are not lined up in a grid, but arranged organically around the property, inserted between trees, outbuildings, etc. A tall privacy fence hides the festival grounds from the highway nearby. There is no electricity on the grounds, so we don’t have to fuss with track lighting, laptops or credit card terminals. Patrons know that the event is a cash-and-carry affair, with an ATM in the town, and the two-day festival is filled with art shoppers. 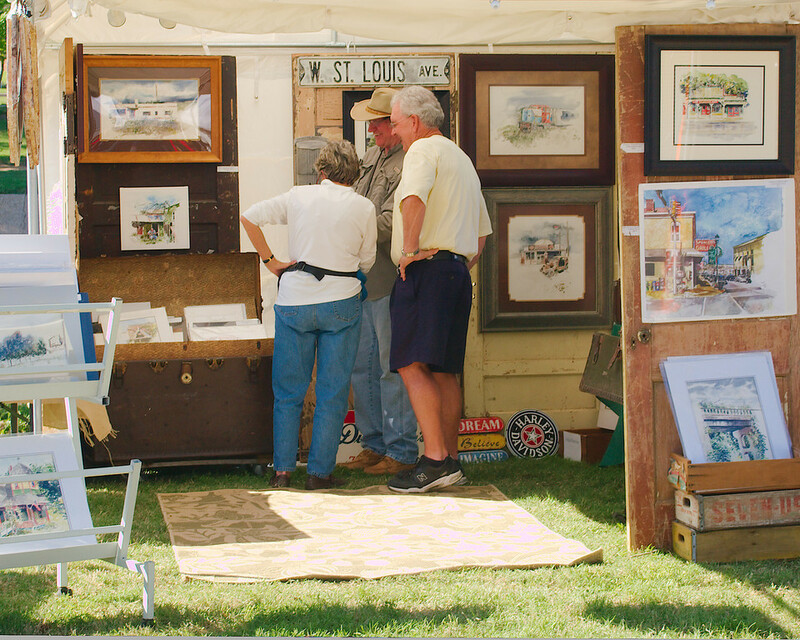 Sales and conversations at the Edom Festival of the Arts are first rate, and I can’t wait to go every fall when the weather begins to cool. Two years back, to save money and time, I decided not to book a hotel (about a thirty-minute drive to the nearest city). I had this romantic and ludicrous notion that I would sleep in the back of my Jeep Grand Cherokee, disregarding my age and lack of general fitness (also disregarding the soreness and achiness that always comes from loading the Jeep, driving two hours, setting up the tent, furniture, and hanging all the art). When darkness descended, I crawled into the back of my Jeep that was parked near the forest with all the other artists’ vehicles and trailers (a number of them have camping trailers for accommodations). The night grew chilly, and I never got comfortable in the back of my vehicle. I chafed at my lack of judgment and slept very little as the night wore on. Finally, just before dawn, I decided I had to get back on my feet. I had slept in my clothes, so I did not have to undergo acrobatic contortions, dressing in the back of the vehicle. Emerging from the Jeep, I trudged with heavy feet up the hill and through the festival grounds. The grass was wet with dew, temperatures were in the upper forties (the sweatshirt and jacket were doing their job just fine), and as I walked among the gleaming white tents in silence, I felt an exhilaration I cannot explain. The morning was crisp, cold and delicious. I loved the scent of the October pasture. The artist “village” was so attractive to me, though all the tents were shuttered and no art work was visible at this hour. 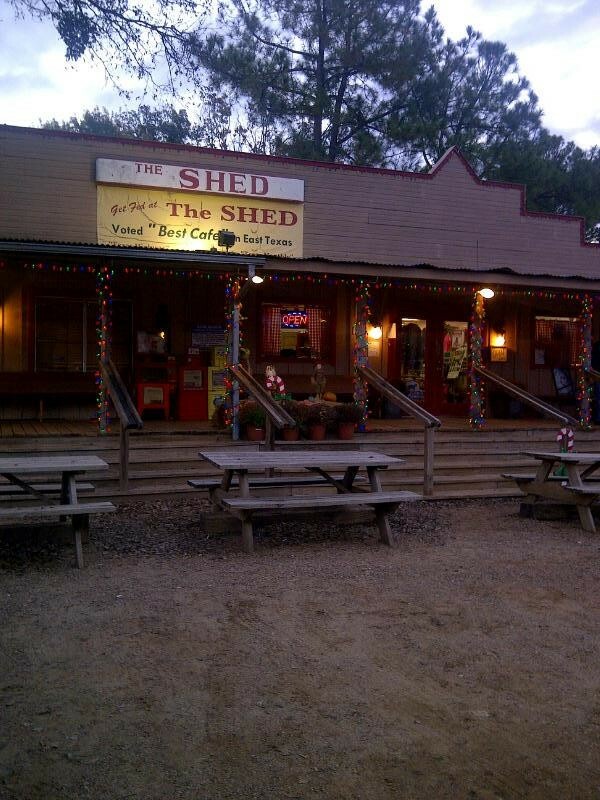 But I loved the morning walk through the darkness, and as I wended my way toward The Shed Cafe (not visible because of the privacy fence), I could only hope that it opened according to “traditional country cafe hours”. It was 6:05 and still dark. Rounding the corner of the privacy fence, I saw what is posted at the top of this blog (this photo was taken later, nearer Christmas time, hence the holiday lights). Warm light poured out of every window, smoke was billowing out of the chimney, and I instantly smelled eggs frying, bacon, ham, biscuits, gravy, coffee–the works! I cannot describe the rush of good will that filled me at that moment. All the achiness and sleepiness from the goofy night sleeping in the Jeep disappeared, and all that mattered was the warm, affirming feeling of a hot country breakfast. The food at The Shed is among the finest I’ve ever had, and regardless of the success in sales at the Edom Festival, breakfast at The Shed is the highlight of the weekend. 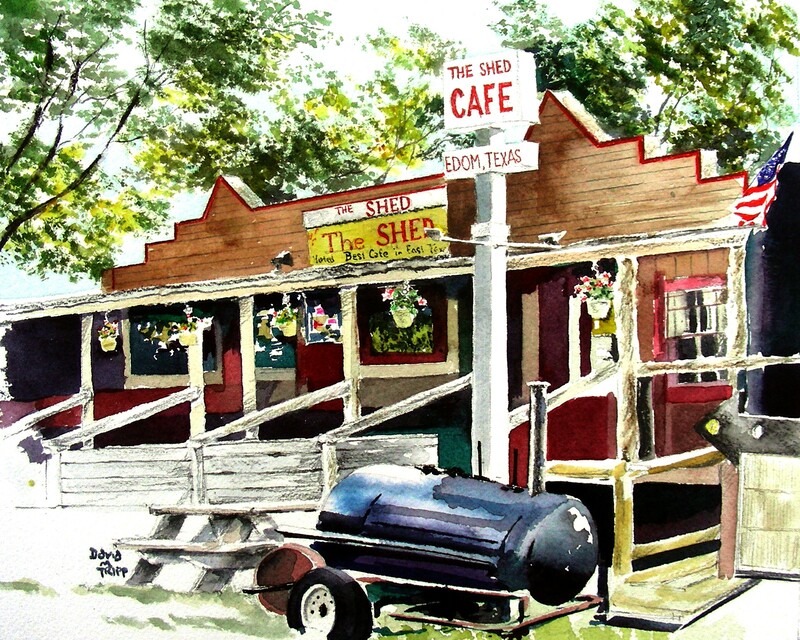 Last winter, I painted this 8 x 10″ watercolor of my favorite east Texas eatery. As I write this it is Saturday morning. Though I did not get in until after midnight last night, and the preceding 48 hours were consumed by the packing, loading, traveling and setting up of my tent at the Art on the Greene festival, I awoke several times in the pre-dawn, and finally got up a little before 7:00. The printer has been busy, with over thirty 8 x 10″ prints now ready for matting and sleeving in plastic. I’m opening the blinds to let the dim early morning light enter my studio, and am pouring my first cup of coffee. And I am smiling inwardly with contentment. We opened yesterday at 3:00 to perfect weather and good crowds. I enjoyed many, many conversations with patrons, and this morning I cannot let go of the words of one who purchased several works: “I cannot stop looking through all these, because your paintings move me.” Purchases are wonderful, but nothing gratifies me more than hearing someone say that s/he is moved when looking at my work. I know how stirred up I am when I see something that compels me to paint, and I know how I am moved when I work on a painting and everything seems to be coming together. But everytime an observer shares with me that s/he is moved when looking at my paintings, I feel that rush anew. So, this morning the light through the window is better, and the coffee is better. For a number of years, I walked through art festivals, making the occasional purchase, chatting up the artists and admiring the works on display. Being an artist myself, I often wondered what it would be like to be on the inside of this operation. I finally threw my hat in the ring, and have now lost track of how many years I have moved in the festival circuit. It feels like seven or eight maybe. I could probably write a book on that experience, but I doubt that it would be an interesting read. Some years I have participated in as many as a dozen festivals, while holding down full-time high school and three-quarter time college positions. That was too much. Now I have my routine down to about a half dozen festivals per calendar year. Since I do this alone, I cannot exactly mingle about the festival and leave my booth unattended. But I do feel a calm sense of contentment when I arrive early and move through the “village” as booths are opening, and artists are all in a chatty frame of mind. I enjoy the sounds of the morning conversations and the “waking up” of the art scene. Perhaps one day I’ll tell my favorite story involving a delicious experience at Edom Festival of the Arts that occurred in the wee morning hours. But for now, I have packaging to do in prepartion for this Saturday, an eleven-hour run. I have posted a photo of my booth at this event from two years ago. I’m still setting up for this weekend’s festival as I write this. Hopefully, tomorrow I’ll have a current picture posted of our annual event here in Arlington, Texas. The young man was up late again, bedding down in the store room of the old filling station. He had closed the place at dark, but was too engrossed in his college studies to pack up the books and head for his garage apartment in the next county. So, with the owner’s permission, he would spend another night in this shack, amidst the smells of gasoline, oil, pit grease and the grime that had built up over two generations. The Texaco station was anchored on historic Route 66 in an obscure town east of Amarillo, Texas. Interstate commerce had all but obliterated the sleepy town, and as soon as this fellow graduated from the community college, he would depart as well. The local townspeople and patrons had no knowledge or regard for the things that stirred the soul of this young man. His volumes of Thoreau, Frost, Whitman and Twain had opened to him worlds beyond this community. And his few camping possessions stored in this room (Griswold frying pan, stove top percolator, kerosene lantern, Maxwell House tin) were the tether that kept him bound to the wild. He would be packing up his gear in a week and leaving without notice. It was time to emerge from this cocoon and embrace the world that was calling out to him. 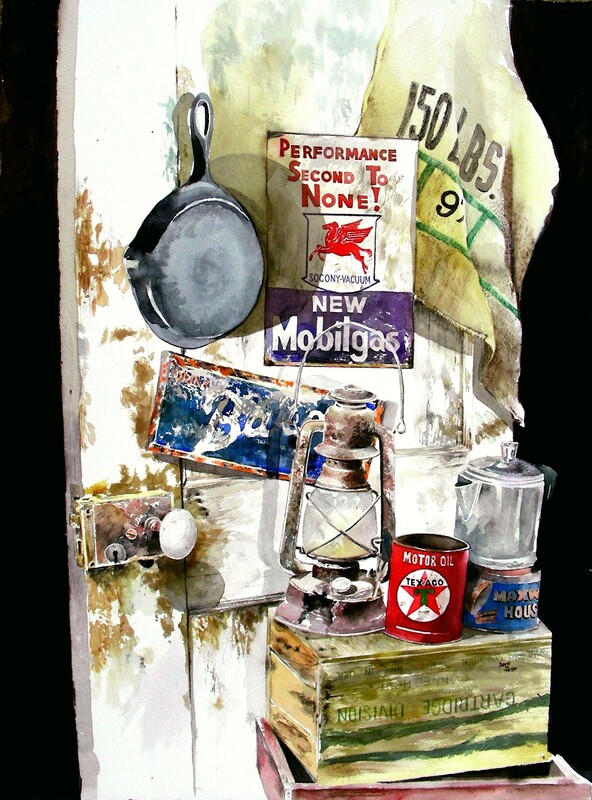 I hope to display this companion still life piece beside the fishing still life in the weekend art festival approaching–Art on the Greene in Arlington, Texas. http://www.artonthegreene.com/ Again, I have fabricated a short story to put on the back of the 5 x 7″ greeting cards bearing the image. I sell these cards for $5 each, five for $20. Sometimes, the greeting cards sell better out of my booth than the limited edition prints and orginal watercolors. When the neighbors hammered the padlock off the deceased man’s fishing shed, they peered inside the darkened room with sadness at the world of memories their dear friend had left behind. Guarding the assembly from its high perch, the kerosene lantern called to memory nights spent on the Mississippi River dikes, waiting for catfish that would find their way to the Griswold skillet. The Canada Dry crate was the old fisherman’s stool for the nightlong vigils. Bass fishing featured the Garcia Mitchell open-faced reel and the vintage wooden plugs for the area lakes and ponds. In his retirement years, fly fishing took over, and the old man delighted in the long road trips in his Dodge pickup to the Colorado Rockies where he would not be heard from for weeks at a time. The battered suitcase was his lifelong road companion, as was the dark leather knapsack that he bought from an old leathershop on the dusty streets of Athens during his European excursions. The old man had not been heard from for more than a week, and the inquiring neighbors were saddened to enter his home and find him in his final resting place–his favorite recliner in the small front room of his ramshackle house. His cup was still half-filled with the Dining Car Coffee he relished throughout his years working on the Frisco railroad. Now, only his possessions remained to tell his life’s story. I’m gearing up for a three-day art festival this weekend: Art on the Greene in Arlington, Texas. 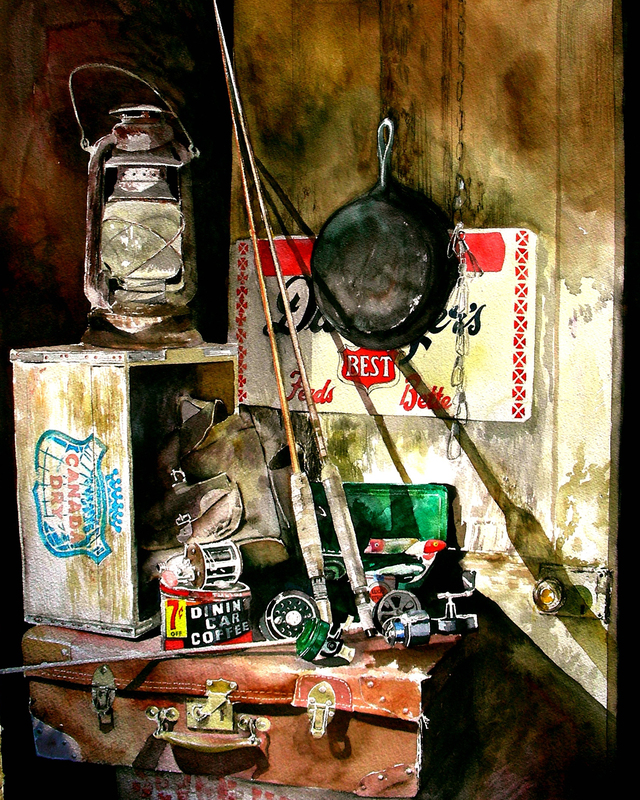 I brought back from the Bowman Gallery in Portland my large framed fishing still life watercolor that I plan to install as a centerpiece to my booth display. Greeting cards of the painting have just been printed, and posted above is the text I just composed that will appear on the back of the 5 x 7″ cards. I wanted the painting to tell a story, so this is the one I just pulled together. The story is one that I’ve carried in my consciousness for quite a few years now, wishing that I could write a novel or short story around the old man’s life and travels. At any rate, I have a small piece to put on the back of a card. I love watching patrons reading the backs of my cards when I’m selling out of an art booth. It shows me that they have imagination and interest that go beyond just the images of the art work. Thanks for reading. I still have quite a bit to assemble and pack tonight. The show is just a matter of days away. There is a reason for my recent hiatus in blog posting. Spring Break arrived and I drove south to Portland, Texas, adjacent to Corpus Christi. Whitman’s poem flooded my heart with joy as I made the 6 1/2 hour road trip down state highway 77 (avoiding the Interstate), meandering my way through small towns and rolling prairie all the way. I was scheduled to teach a two-day watercolor workshop there, and decided to spend a couple of extra days learning important details about custom framing and matting from Mike Catlin of Bowman Design and Framing. Time spent there was filled with adventure, and I met ten new friends who took the workshop with me. Above, I posted a small watercolor sketch I worked on during the final day. We were scheduled for plein air activity that day, but the sun was overcast all morning and the rain was intermittent throughout the afternoon. So, we took our easels just outside the gallery and painted/sketched as we could. I had to bring my sketch in twice out of the rain before finishing it. 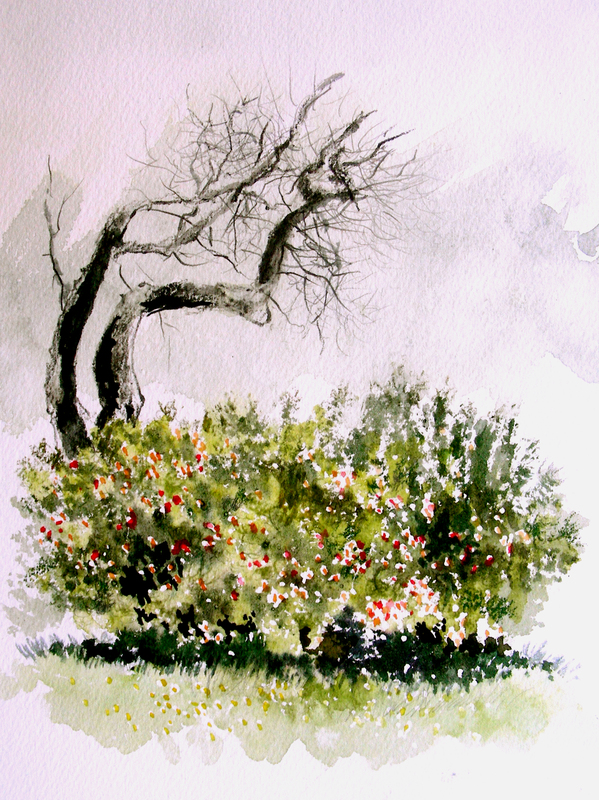 I worked on a flower-filled bush with a dramatic gnarled tree twisting upward behind it. Time spent on it was relaxing, and I enjoyed plenty of laughter and conversations with the workshop participants as they all took joy in their painting. 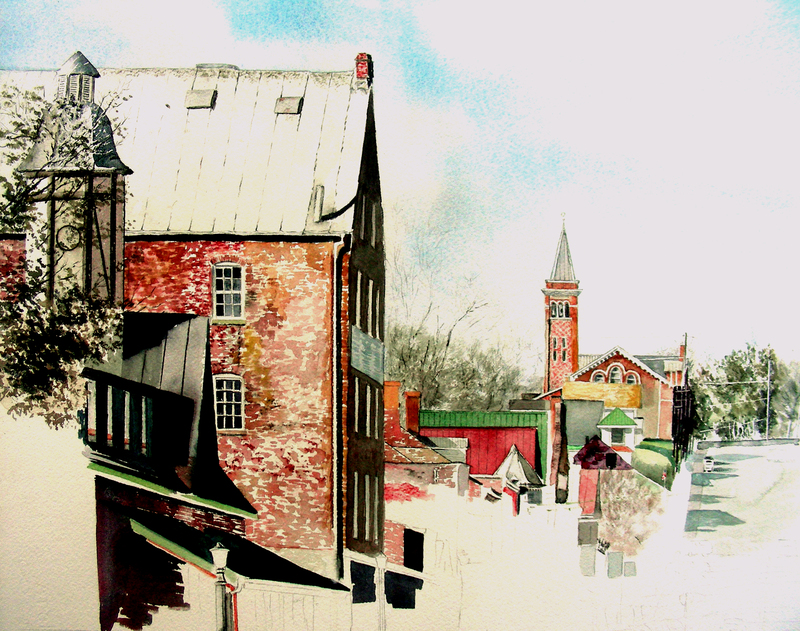 Between sessions, I found some time to continue work on this large Hermann, Missouri painting that I have been chipping at for over a week now. I spent most of my time darkening the lower left-hand portion of the composition and adding texture to the brick on the side of the main building. Our workshop was held inside and outside of Bowman Gallery, pictured here. I also learned a great deal about framing and presentation, thanks to Mike’s patience and willingness to demonstrate. 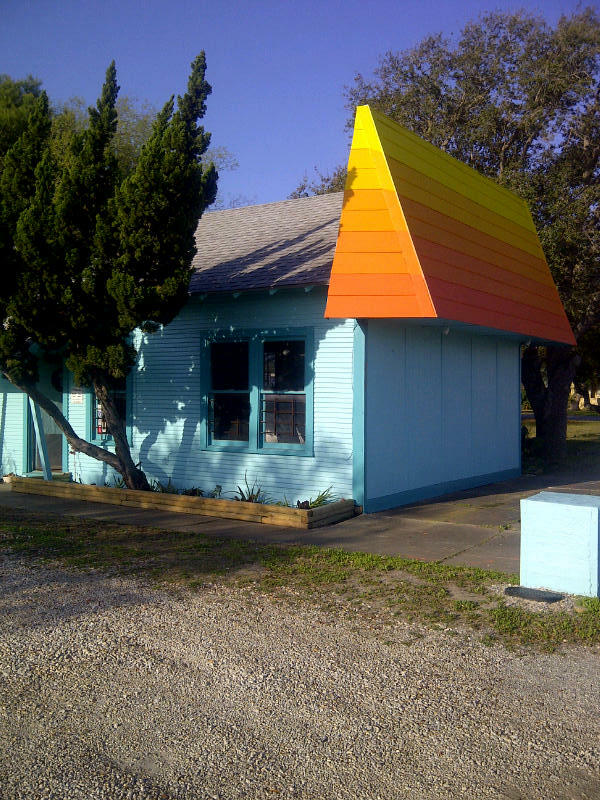 The facility offered fine studio space for quality work after business hours as well. On one of the evenings, after a few hours of painting in the studio (I’ll post that pair of paintings when I get further along with them–the subject is saltwater flies for fishing), I took a long, satisfying walk along the coast. 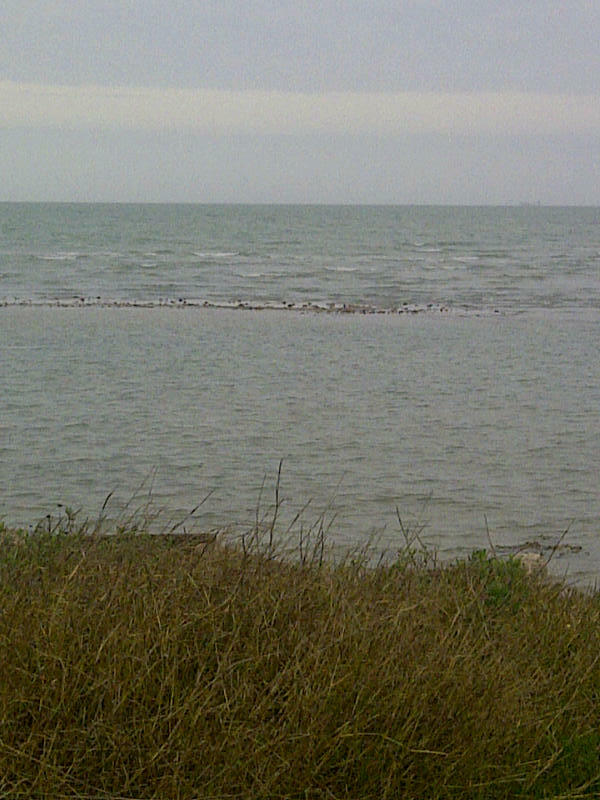 The water’s edge is only about 200 yards from the studio, and I found the vistas positively delicious. There was a gentle, humid breeze blowing and the evening was unusually quiet for one who’s grown too accustomed to life in the suburbs. I found a quiet place to nest for awhile and enjoyed reading from the writings of Paul Gauguin. I am nearly finished with The Writings of a Savage. Today finds me back in school, rested enough to return to the weekly routine. I’ll be forever grateful to Mike Catlin and Dinah Bowman for offering me the workshop this past week. But at the same time this question arises and I am perplexed: where does the painting of a picture begin and where does it end? At the instant when extreme feelings are merging in the deepest core of one’s being, at the instant when they burst and all one’s thoughts gush forth like lava from a volcano, doesn’t the suddenly created work erupt, brutally perhaps, but in a grand and apparently superhuman way? Reason’s cold calculations have not led to this eruption; but who can say exactly when the work was begun in one’s heart of hearts? Perhaps it is unconscious. Reading allows me to be in communion with other people without having to mingle with the crowd, which always frightens me. It is one of the adornments of my solitude. The day began deliciously at 6:00 with plenty of quality studio time. Then 9:00 came, businesses opened, and I had to take my Jeep to a couple of establishments for some routine maintenance. Unfortunately, the wait was long. Fortunately, I brought my Gauguin, Writings of a Savage. Good thing too–I spent more than two hours sitting in reception areas, waiting for work to be completed. I found Gauguin’s writings very engaging, and didn’t fret the long wait hours. After two more stops beyond Jeep maintenance, I finally got back home to my studio and picked up the brush a final time, finishing this watercolor. It’s been satisfying. The painting started very badly, and finished alright. I’m pleased. Now, I turn my attention to the large Hermann, Missouri composition. What a satisfying Spring Break!